MSA Respiratory Protection & Accessories. 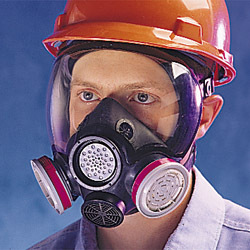 Full-Face Respirator features a light-weight, wrap-around, flexible lens to offer a comfortable fit with a wide view. Constructed of super soft Hycar rubber. Low maintenance, requiring only routine filter replacement. Features speaking diaphragm & nosecup. Can also be used with Comfo� Classic cartridges when used with adaptors. MFR Part No's 805414, 805408, 805420. This is NOT the Advantage 1000 Gas Mask. View the MSA Advantage 1000 Gas Mask in our CBRN product line. 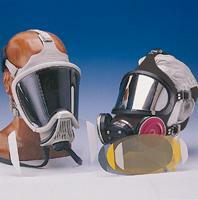 Full-Face Respirator incorporates MSA �s global engineering expertise and is designed to meet NIOSH and EN standards. Features a wraparound lens combined with a soft, pliable silicone facepiece that provides a total solution to your air-purifying respirator needs. Utmost in convenience, Advantage 3000 uses the same cartridges and filters as the Advantage 200LS Respirator. Enhances worker performance through a new design that allows even lower breathing resistance and includes a standard nosecup that reduces fogging in low temperatures or high humidity conditions. The facepiece lens has a scratch resistant coating and has been engineered to be optically correct, giving you superior visibility and peripheral vision. The lens, which exceeds the performance requirements of ANSI Z87.1, eliminates distortion. Advantage 3000 is same as Advantage 3200. MFR Part No's: 10028996, 10028995 & 10028997. 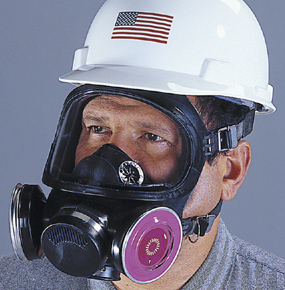 This half-face respirator offers unmatched fit and comfort with a clear blue facepiece. 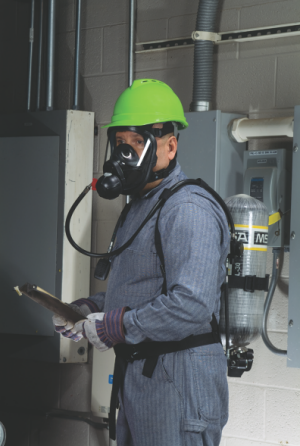 Thermoplastic rubber subtracts 25% of the weight and adds softness to MSA's Advantage 200 LS respirator. Patented MultiFlex� System equalizes pressure on the face-seal area, while delivering exceptional stability, so the respirator will not collapse during wear. The AnthroCurve sealing surface instantly conforms to each wearer�s unique facial characteristics. 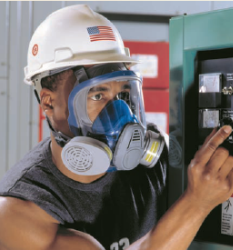 The Advantage 200 LS respirator is approved by NIOSH for use against a variety of respiratory hazards. Dual Strap MFR Part No's: 815696, 815692, 815700 (shown in left picture above). Single Strap MFR Part No's: 815448, 815444 & 815452 (shown in right picture above). With its UniBond over-mold facepiece, AnthroCurve� face seal, and low profile design, the Advantage 400 Respirator series is the superior option for respiratory protection. The over-mold facepiece and face seal ensure the unit provides an excellent fit and comfort to the wearer. 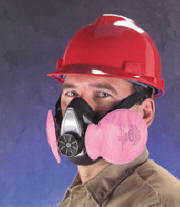 Unique yoke and harness design (patent pending) allows a user to easily don and doff the state-of-the-art respirator while maintaining a customized fit. Other features include a ComforTop headband, a built-in moisture release chin cup hole, and the extra-wide head and neck straps. 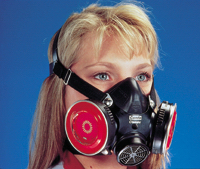 The only MSA respirator that is 100% latex free. MFR Part No's: 10102182, 10102183 & 10102184. N Respirators may be used for particulate aerosols free of oil (non-oil). Time use limits apply. R Respirators may be used particulate aerosols containing oil. Time use limits apply. 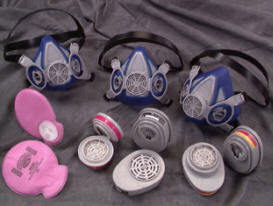 P Respirators may be used for all particulate aerosols. No time restrictions apply, the limitations are hygiene and breathing resistance. N95-Particulate Filter (95% filter efficiency level) effective against particulate aerosols free of oil; time use restrictions may apply. R95-Particulate Filter (95% filter efficiency level) effective against all particulate aerosols; time use restrictions may apply. P100-Particulate Filter (99.97% filter efficiency level) effective against all particulate aerosols. An assortment of facepiece accessories that provide added lens durability or shading for special applications. Provide a convenient way to add a layer of protection against scratches. Clear lens covers only. (Smoke-tinted has been discontinued). An improved version of the Comfo II respirator, featuring new SoftFeel� facepiece material, which increases the comfort factor dramatically. SoftFeel material is an exclusive new formulation that improves the pliability and softness of both Hycar rubber and silicone, the two facepiece materials available with Comfo Classic respirators. The Comfo Classic respirator features a unique face seal design that gives the wearer an exceptional fit. Use MSA Cartridge Service Life Calculator to establish a cartridge change-out schedule. Hycar Mfr Part No's: 808075, 808074 & 808076. Silicone Mfr Part No's: 808072, 808071 & 808073. Features an inturned lip around the edge for a secure, comfortable seal against the face, a large chin cup for easy positioning, as well as five suspension headstraps and roller buckles that hold the facepiece in place while minimizing hair entanglement. Wide polycarbonate lens resists scratching and chemical attack and is held in place by a two-piece lens ring which is color-coded to indicate the size of the facepiece. The Ultra-Twin includes a speaking diaphragm for clear, short-range communications, a nosecup to reduce lens fogging and uses the full line of Comfo cartridges and filters. Use MSA Cartridge Service Life Calculator to establish a cartridge change and schedule. Hycar MFR Part No's: 471298, 471286 & 471310. Silicone MFR Part No's: 480263, 480259 & 480267. Color-coded to indicate the type of protection offered. See MSA's information page for additional information and options. For custom configurations, please call MSA directly at 800-672-2222 for their Assemble-To-Order part number, then contact us with thier MFR part number. 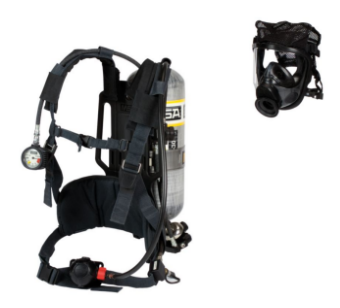 Lightweight, durable and economical, this SCBA keeps contaminants at bay. For industrial-hazard applications only - NON-NFPA. Kevlar harness with chest strap. Ultra Elite hycar rubber facepiece, size medium. 45 minute low profile carbon 4500 PSI Cylinder. Special order item - cannot be cancelled, returned or refunded once ordered.